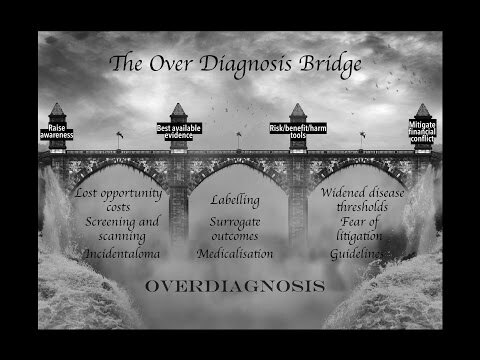 As I said in a previous post, overdiagnosis and the resulting unnecessary treatments cost hundreds of billions of dollars every year. Equally bad, if not worse, I think, is the psychological harm caused by fear, financial stress and pain. You can’t put a dollar amount on that. Dr. McCormack criticizes the trend to “widen the thresholds” of disease. That is, creating new conditions such as “pre-diabetes” or “pre-hypertension,” or lowering targets or goals for screening tests such as cholesterol or bone density. Less than 20% of people get a cardiovascular benefit from life-long treatment. 100% of people experience harm (side effects or inconvenience or cost or fear or [negative] labeling). 2 out of 3 people over-estimate treatment benefits and/or under-estimate harm. If you like this video, watch more of them on Dr. McCormack’s YouTube Channel.